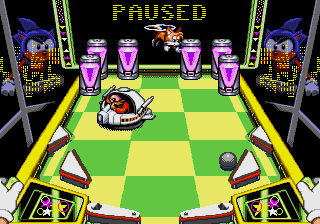 At the end of each of the first three stages of Sonic Spinball, Sonic gets to play a Bonus Stage. These bonus stages have a totally different perspective as Sonic himself is controlling a pinball machine. 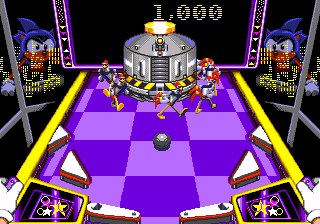 Sonic's eyes in the reflected images follow the ball currently in play. The player is given a task to complete and three balls to play with. Flipper controls are the same as in the normal game, but the ball cannot be controlled with the D-pad. Pressing all the flipper buttons at once will make Sonic shake the machine, though repeated shakes will cause a tilt and lock the flippers. Trapped Alive: The object is to destroy all the robot machines and free the helpless animals trapped inside them and then destroy Robotnik. Among the prisoners are Tails, and also several characters from SatAM: Bunnie Rabbot, Sally Acorn, Rotor Walrus and Muttski. 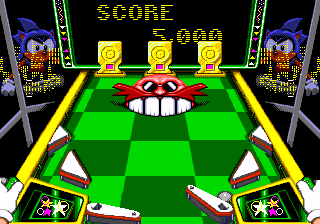 Robo Smile: A grinning Robotnik face moves across the machine. The objective is to knock out all of Robotnik's teeth. The March: Similar to Trapped Alive, the object is to destroy the capsule and free the animals and Freedom Fighters within. The capsule is circled by a ring of Scratch robots. 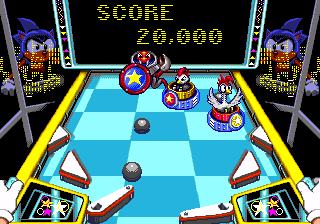 Clucker's Defense: A hidden multi-ball bonus game can be played on any stage, but only if the player manages to collect every Ring in the zone. Several star circles will appear in the stage, hidden at various points. By leaping into them, Sonic will be warped to this bonus round. The objective is to destroy a Crawl who is protected by a pair of Cluckers. This page was last edited on 31 March 2019, at 07:48.